In 1889 the Sioux, upon their reservations in South Dakota, were much dissatisfied. Their cattle were dying, their crops had failed, there were no buffalo, and the Government supplies were not being issued according to promise. The Sioux no longer occupied the Great Sioux reservation of western South Dakota. By several treaties they had sold the greater portion of that land. The last treaty, signed only this year, had left them five tracts, as reservations. On the Missouri River at the middle north line of South Dakota there was the Standing Rock reservation, where lived Sitting Bull and many of the Hunk-papas and Oglalas whom he had led. Next to it, on the south was the Cheyenne River reservation, for the Miniconjous, Without Bows, Two Kettles, and others. Then there was a wide strip of land which had been sold, with the small Lower Brulé reservation in the east end of it. Then, side by side against the Nebraska line, south, there were the Rosebud reservation, for the other Brulés; and Chief Red Cloud's Pine Ridge reservation, for his Oglalas, and various bands. The Sioux numbered twenty-five thousand. The lands left to them were the poorest of the lands. White men had failed to make a living upon such lands. The Sioux were supposed to help themselves by farming and cattle raising, but they found themselves starving. Sitting Bull had been placed upon the Standing Rock reservation in May, 1883. His home was a log cabin with a stable and corral, on the Grand River in the southern part of the reservation. He still kept a peace pipe, as sign that he would not go to war. He had been among those who opposed the selling of the lands. After the last sale, this year, he was asked what the Indians thought about it. "Indians!" he angrily blurted. "There are no Indians left now but me." He viewed the Sioux police sullenly. These were a fine company of fifty young Sioux under First Lieutenant Bull Head and Second Lieutenant Chatka. They were drilled as United States soldiers, wore the army uniform of blue, and were well armed. Their duty was that of keeping order for the Indian agent. They were proud of their trust, and faithful to it. Now in the fall of 1889 the restless Sioux heard a voice. Their young people were being educated at the Indian schools of the East, and at the agency schools, and were learning to read and write. The eastern school Indians exchanged letters with Indian friends whom they had met or of whom they knew; the agency school Indians in different parts of the country also wrote letters. Word came by letters from the west, to Sioux at the Pine Ridge agency, that beyond the Rocky Mountains a man who claimed to be Christ, the Son of God, had appeared upon earth. The white people once had tried to kill him by nailing him to a cross. He was back again, to punish them for their treatment of him, and for their treatment of the Indians. The Indians were to be his people, and possess the land. This sounded reasonable. It aroused curiosity and hope. It was only the same old story, as spread by other prophets, and here put in a little different form; but the red people of America had never yet ceased to look forward to a miracle that would restore to them their game and their liberty and their loved country. Old Chief Red Cloud, Young-man-whose-horses-are-feared and other head men of the Pine Ridge reservation called a council, to choose delegates who should travel into the west and find out if the Arapahos and Shoshonis of Wyoming were telling the truth. Kicking Bear from the Cheyenne River reservation and Short Bull from the Rosebud reservation, were the leaders selected. The other men were Good Thunder, Flat Iron, Yellow Breast, and Broken Arm, from Pine Ridge. Without permission from their agents they traveled west into Wyoming, to talk with the Arapahos and Shoshonis at the Fort Washakie reservation. Some Cheyenne delegates from the Tongue River reservation in Montana were there also, seeking information. The Arapahos and Shoshonis said that the word was true. The Messiah had come; he did not live among them, but was living west of the mountains, among the Fish-eaters. A Bannock Indian had brought the news across to them. They had sent men to see. The men had seen the Messiah, and had talked with him. They had seen the dances that he had ordered, which would waken the dead to life and populate the earth again with Indians. Porcupine and his Cheyennes, and Kicking Bear and Short Bull and their Sioux were much impressed. They decided to go on, and see for themselves. So they did. They got on the train at Rawlins, Wyoming, and rode all day and branched off by another train, and rode still farther, and arrived at Fort Hall of Idaho, in the Bannock country. From here the Bannocks guided them onward, by train and by wagon, until at last they reached the country of the Fish-eaters, or Pai-Utes, at Pyramid Lake in western Nevada! The Pyramid Lake Fish-eaters sent them south, to Walker Lake of the Pai-Utes. Here they met the Christ, listened to his talk, danced the sacred dances, and felt that everything was true. Kicking Bear and Short Bull and their Sioux were absent from the Sioux reservations all winter. They sent back letters from Wyoming, Utah, Idaho and Nevada, telling of their progress. In April, of 1890, they returned. They reported to the council. They had seen the Messiah. Delegates from many other tribes had been there, too. The Messiah talked to each tribe in its own language. He bore the scars of nails, on his wrists. He looked like an Indian, only lighter in color. He taught them dances called Ghost Dances, which would bring the spirit people back upon earth. He fell into a sleep, and went to heaven and saw all the spirit Indians. The earth was too old; it was to be made new and would stay green and new, and the Indians who obeyed his teachings and lived good would never be more than forty years old, themselves. This fall all the good people were to be made young; and after that they would be made young every spring. Anyone who had shaken hands with the Messiah could call him in sleep. The Sioux delegates told their story over and over again. At the Cheyenne reservation in Montana, Porcupine talked for five days and four nights. There was indeed a Pai-Ute prophet, named Wo-vo-ka or the Cutter. He later took the name Kwohit-sauq, or Big Rumbling Belly. To the white people he was known as Jack Wilson. He had worked on ranches near the Walker Lake reservation, until, when he was about thirty years old, while sick with a fever he went into a trance, during an eclipse of the sun. On waking up, he said that he had been to heaven, had visited God and the spirits, and had received command to preach a new gospel. The Pai-Utes were glad to believe whatever he claimed for himself. He seemed to hypnotize them. The word that Wo-vo-ka was the Messiah and could perform miracles spread through the Pai-Utes of Nevada and the Utes of Utah; it crossed the Sierra Nevada Mountains into California on the west, and the Rocky Mountains into Wyoming on the east; and it kept going, east and north and south. This spring Good Thunder, Short Bull, Cloud Horse and Yellow Knife journeyed to see the Messiah again. When they came back they reported that he had appeared to them out of some smoke. He welcomed them, and showed them a land that bridged the ocean, and upon the land all the Indians of all nations were on their way home again. They saw lodges, of buffalo hides, in which the dead were living. 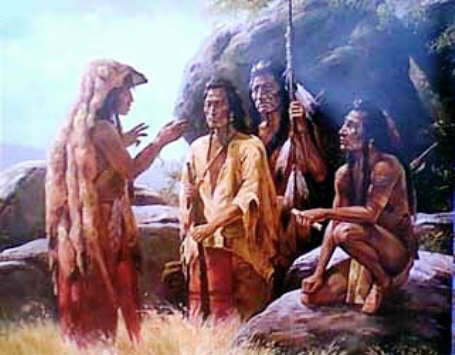 They talked with dead Sioux whom they had known. The Messiah had given them red and white paint that would ward off sickness, renew youth, and cause visions. He had told them to have the Sioux send their children to school, and to attend to farming. There was to be no fighting with the white people. But the whites were to be destroyed, by a great landslide that would cover the world with new earth. Upon the new earth would roam the buffalo and deer, as of old. The Indians who obeyed the Messiah would be lifted up, above the landslide, and gently dropped back again, there to live forever with all their friends and relatives who had come with it from spirit land. This reunion was to occur the next spring, of 1891, when the grass was knee high. The Good Thunder party brought what they said was a piece of buffalo meat. The Messiah had told them that if on their way home they killed any buffalo, they were to leave the hoofs and tail and head on the prairie, and the buffalo would spring up, whole, when they turned their backs. All the buffalo would act this way, in the happy time to come. The day of buffalo herds on the plains was past; but the party asserted that they did find a herd, and killed one buffalo—and he sprang up, from the hoofs and tail and head, just as the Messiah had promised. The Cheyennes, the Shoshonis, the Arapahos, the Kiowas, the Utes, the Pai-Utes, were dancing the Ghost Dance. The Sioux now danced. The Ghost Dancers danced in a circle, holding hands and chanting, until they fell over and went to spirit land. From the spirits they brought back signs, such as buffalo tails, buffalo meat, and other things of an Indian country. The Sioux Ghost Dancers wore Ghost shirts, of white muslin. These Ghost shirts would turn a bullet; no enemy weapon could pierce a Ghost shirt! That was the word of Kicking Bear and Short Bull. The Ghost Dance ceremonies were many, and the dance was noisy. Away up on the Standing Rock reservation, which had not yet joined in the craze, Sitting Bull, the former great medicine leader of the Sioux, was much interested. The agent, Mr. James McLaughlin, refused to permit him to visit Kicking Bear, the prophet on the Cheyenne River reservation, south. Kicking Bear was hard at it, preaching the Messiah religion to his Miniconjous and the other Sioux there. But Sitting Bull was anxious to learn. So he sent six of his young men down, to ask Kicking Bear to come up for a visit at the Grand River in the Standing Rock reservation. Kicking Bear appeared, in October, this 1890, with several of his followers, and preached to the Sitting Bull people. "My brothers, I bring to you the promise of a day in which there will be no white man to lay his hand on the bridle of the Indian's horse; when the red men of the prairie will rule the world, and not be turned from the hunting grounds by any man. I bring you word from your fathers the ghosts, that they are now marching to join you, led by the Messiah who came once on earth with the white men, but was cast out and killed by them. I have seen the wonders of the spirit land, and have talked with the ghosts. I traveled far, and am sent back with a message to tell you to make ready for the coming of the Messiah and return of the ghosts in the spring." This was the commencement of Kicking Bear's sermon, as reported to Agent McLaughlin by One Bull, an Indian policeman who was Sitting Bull's nephew. Kicking Bear spoke for a long time. He told Sitting Bull everything. The new earth, that would bury the whites, was to be five times the height of a man. It would be covered with sweet grass, and with herds of buffalo and ponies. The Pacific Ocean would be filled up; the other oceans would be barricaded. The white man's powder would not burn, against the Ghost Dancers. The whites who died would all belong to the Evil Spirit. Only the Indians would enjoy life, under the Good Spirit, with no white people to molest them. To the unhappy, starving Sioux this was a promise full of hope. Sitting Bull at once took the lead at McLaughlin, Rock. He danced himself, reported Agent McLaughlin "to mere skin and bone." He introduced new wrinkles of his own. Down at pine Ridge reservation old Red Cloud had adopted the new belief. On the Rosebud reservation Short Bull, who also "had seen the Messiah," was making the Brulés defiant. Now at Standing Rock Sitting Bull had the fever, and was tireless. Kicking Bear proved to be a nuisance. The Sioux feared him. It was said that in the dark there was a halo around his head, and a star over him; that he had the power to strike unbelievers dead, with a look, or change them into dogs. Agent McLaughlin sent thirteen police under Sergeant Crazy Walking, to arrest Kicking Bear and put him off the reservation. Crazy Walking went, and found Kicking Bear and Sitting Bull in the midst of a Ghost Dancer meeting. He listened to the stories, and was afraid of the medicine. He returned to the agency, and said that Sitting Bull had promised that Kicking Bear should leave, the next day. Agent McLaughlin called Second Lieutenant Chatka. Lieutenant Chatka had good sense. He was a soldier and did not put much faith in such "medicine." He asked for only two men, and rode straight to Sitting Bull's camp, on the Grand River, forty miles south of the Agency quarters. The Sioux there were dancing—which made no difference to Lieutenant Chatka, although some of them were his relatives. He broke through the circle, told Kicking Bear and his Cheyenne River reservation squad that they must get out; and escorted them twenty-five miles south, to the line between the two reservations. Thus Lieutenant Chatka proved himself to be a faithful officer. This night Sitting Bull snapped his peace pipe in two, before his Ghost Dancers. His heart had swelled within him. "Because I want to fight and I want to die, if need be, for this new religion." He declared that the dancing must continue. The spirits had said that the Sioux must dance or they would lose their lives. Four hundred and fifty of the Standing Rock Indians were his devoted followers. It was he who translated the messages received for them from the spirit world. It was he who anointed them, after the sweat baths, with the sacred oil. It was he who urged them to dance until they dropped at the wave of his sacred feather. He was all-powerful, again. First Lieutenant Bull Head, of the Sioux police, lived three miles west of him, up river, and was watching him. Sitting Bull did not like to be watched. The police irritated him. The constant dancing, day and night, on the reservations, alarmed the white officials. It was a threat, like the threat of Tecumseh and the Open Door. "My friends and relations: I will soon start this thing in running order. I have told you that this would come to pass in two seasons, but since the whites are interfering so much, I will advance the time from what my father has told me to do, so the time will be shorter. Therefore you must not be afraid of anything. Some of my relations have no ears, so I will have them blown away." He told them all to gather in one place and dance and make ready. Even if the soldiers surrounded them four deep, no harm would occur. At last, on request of the agents at Pine Ridge and Rosebud the troops entered, to keep order. Short Bull, Kicking Bear and other prophets of the Messiah led their people into the Bad Lands, in the northwest corner of the Pine Ridge reservation, there to await the promised time. They had destroyed their houses, and the houses in their path. Many of the Sioux who had not danced went with them, or joined them, because of fear of the soldiers. They feared being arrested and held as hostages. Soon there were three thousand of the Sioux in the Bad Lands. This left Sitting Bull and his dancers alone, up at Standing Rock, with the police watching them. He felt that he ought to go to the Ghost Dance big camp, in the Bad Lands. And he decided that he would. Agent McLaughlin had asked him to come to the agency for a talk; but Sitting Bull well knew that if he did go to the agency, he probably would be arrested. So he declined. Next, Agent McLaughlin arrived, in person, and roundly scolded him for encouraging the "foolish" dancing. Sitting Bull proposed to Agent McLaughlin that they journey together into the west; and that if they could find no Indians there who had seen the Messiah, he would tell his people that it all was a lie. But Agent McLaughlin refused to do this, although it seemed to be a fair proposition. When he rode away, the Ghost Dancers threatened him; but Sitting Bull would permit no violence. He had been bathing, and wore only his breech-clout. He stood almost naked in the cold, and kept his people from attacking, until the agent was out of sight. Sitting Bull prepared to join the other Ghost Dancers, who would be expecting him. His horses had been doing nothing. They were well fed and strong, and if he got a head start, he knew that he could keep it. So, to show that his heart was not all bad, he had his son-in-law, who could write a little in English, write a note to Agent McLaughlin. Bull Ghost, who was called "One-eyed Riley" by the white people, and who was his chief assistant in medicine making, took the note to the agency. This was December 13. The note said, as far as Agent McLaughlin could read it, that Sitting Bull had decided to go to Pine Ridge, in order to know more about the prayers. He did not like to be called a fool, and to have his prayers interrupted by gun and knife. Lieutenant Bull Head was as smart as he. The lieutenant knew exactly what was in Sitting Bull's mind; and he, too, sent a note to Agent McLaughlin, saying that if Sitting Bull got away on his fresh ponies, the police would not be able to catch him. The arrest ought to be made at once. The troops already had been directed to arrest Sitting Bull. "Buffalo Bill" Cody, the famous scout, had arrived, to manage the arrest by help of the soldiers. But Agent McLaughlin warned that if the soldiers went down, there surely would be a fight, and many persons would be killed. He was certain that his Indian police could do the work with less trouble. By return courier, who was Second Sergeant Red Tomahawk, this evening of December 14 he sent orders in English and in Sioux, to Lieutenant Bull Head, that Sitting Bull should be arrested the first thing in the morning, and must not be permitted to escape. Sergeant Red Tomahawk rode the forty miles in the dark, over a rough trail, in four hours and a quarter. Other couriers were dispatched, to take orders to the police squads stationed elsewhere. Lieutenant Bull Head was to have thirty-eight regular police and four specials, with First Sergeant Shave Head as his assistant. Two troops of the Eighth Cavalry under Captain E. G. Fechet were to be stationed on the trail part way to Sitting Bull's camp, in readiness to support Lieutenant Bull Head, if necessary. The Ghost Dancers had been guarding Sitting Bull's house, for several nights; but this night of December 14 they had danced until they were tired out. When before sunrise in the morning Lieutenant Bull Head led his troops into the camp, few persons were stirring. Before the camp, which extended several miles along the Grand River, could pass the word that the police were there, Lieutenant Bull Head had rapidly thrown a line of dismounted police around the houses of Sitting Bull. There were two log cabins, one larger than the other. The police did not know in which cabin Sitting Bull would be found. Lieutenant Bull Head ordered eight policemen to enter the smaller cabin; he and First Sergeant Shave Head and ten other policemen entered the larger cabin. Sitting Bull was here, asleep on the floor, with his two wives and his son Crow Foot, seventeen years old. His wives saw the police standing over them, and began to cry. Sitting Bull sat up. "What is wanted?" he asked, but he knew very well. Lieutenant Bull Head briefly told him. "You are under arrest, and must go to the agency." "Very well," answered Sitting Bull, calmly. "I will dress and go with you." "Bring me my best clothes," he said to his wives. "And I shall want my best horse—the gray horse." His clothes were brought. Sergeant Shave Head ordered one of the policemen to saddle the gray horse and have it at the door. While he dressed, Sitting Bull began to complain, and to scold the police for arresting him, who was a Sioux and an old man, when they were Sioux, themselves. But Lieutenant Bull Head said nothing. He was here to do his duty. He placed himself upon one side of Sitting Bull; First Sergeant Shave Head took the other side, Second Sergeant Red Tomahawk closed in behind; and they all went out. Now trouble awaited them. One hundred and fifty angry Ghost Dancers had gathered. They were armed, they were yelling threats, they were jostling the line of police and shoving them about. The stanch police were holding firm, and keeping the space before the door cleared. At the same time they argued with their friends and relatives and acquaintances in the crowd, telling them to be careful and not cause bloodshed. Sitting Bull's gray horse was standing in the cleared space. He started for it, as if to go with the police, when young Crow Foot, his son, taunted him. "You call yourself a brave man. You said you would never surrender to a blue-coat, and now you give up to Indians in blue clothes!" That stung Sitting Bull. He resisted. He began to speak rapidly to his Ghost Dancers. "These police are taking me away. You are more than they. You have guns in your hands. Are you going to let them take me away? All you have to do is to kill these men on either side of me. The rest will run. Our brothers are waiting for us in the Bad Lands, before they make the whites die. When the whites die, only the Indians will be left. But the whites mean to try to kill us all first." Suddenly he shook an arm free, and raised it. "Shoot!" he cried. "Kill the police. They are none of us!" Two of the Ghost Dancers, Catch-the-bear and Strikes-the-kettle, sprang through the line of police, and fired. Catch-the-bear's bullet struck Lieutenant Bull Head in the side. Strikes-the-kettle's bullet struck Sergeant Shave Head in the stomach. Private Lone Man shot and killed Catch-the-bear. With his revolver Lieutenant Bull Head instantly shot Sitting Bull through the body. Red Tomahawk shot him through the head. Then, down together, fell Sitting Bull, Bull Head and Shave Head. Now it was a big fight, of the forty-one police against almost two hundred Ghost Dancers. Lieutenant Bull Head and First Sergeant Shave Head were mortally sick from their wounds; Second Sergeant Red Tomahawk took the command. The fighting at first was hand to hand, with clubbed guns and knives. The squaws helped the Ghost Dance men. "Do not hurt the women and children," shouted Red Tomahawk. And as fast as possible the women were grabbed and hustled into the small cabin. The police were trained soldiers, and used their revolvers freely, although not trying to kill. They drove the Ghost Dancers into the timber along the river south of the Sitting Bull place. "I will run and tell the soldiers," cried Hawk Man No. 1. "Run!" panted Red Tomahawk, to Hawk Man No. 1. "Tell the soldiers." And Hawk Man No. 1 did run, like a deer, through the storm of bullets. His uniform was cut, but he was unharmed. He ran eight or ten miles. Bull Bead and Shave Head were disabled. Fourth Sergeant Little Eagle, Private Afraid-of-soldiers, were lying dead; Special Policeman Hawk Man No. 2 and John Armstrong were nearly dead; Private Middle was bleeding badly. Sitting Bull was stone dead. So was young Crow Foot; so were Ghost Dancers Catch-the-bear, Black-bird, Little Assiniboin, Chief Spotted Horn Bull; Chief Brave Thunder and Chase, another Dancer, were fatally wounded. The fight had lasted only a few minutes. Now the Red Tomahawk men carried their dead and wounded into the Sitting Bull large cabin, to stand off the Ghost Dancers until the soldiers came. They occupied the corral, too, and kept the Ghost Dancers from getting the ponies that had been put there in readiness for fleeing to the Bad Lands. For two hours they held their own, against the raging mob, because they had been sworn into the service of the United States Government. But they did not shoot to kill, except in defense of their own lives. They were Sioux, and had relatives and old-time friends among those people outside. When the cavalry galloped into sight, over the hill beyond, Red Tomahawk raised a white flag, as a signal. But the soldiers either did not see, or else thought it was a trick; for they brought a cannon and fired two shells at the cabin. So Red Tomahawk ordered his men out of the cabin, and mounted them in line upon their horses. Then he took the white flag and rode forward alone, until the soldiers saw who he was, and that the men behind him were the loyal police. Captain The fighting Ghost Dancers ran away. Fechet did not pursue them far. He sent word to them that they had better come back, and they would not be harmed. Sitting Bull was dead, and their religion had not protected them from bullets. Many did come back, cured of their craze. Only a few joined the Bad Lads Ghost Dancers. The news of the death of Sitting Bull, by bullets, was carried into the Bad Lands, and several leaders on the reservation had surrendered, the Indians in the Bad Lands broke camp, to return to their reservations. But some clung to their Ghost shirts. Their hearts were set upon the promises of the Messiah. When they were gathered near Wounded Knee Creek, on the Pine Ridge reservation, and the soldiers were about to disarm them, on the morning of December 29 Yellow Bear, one of the medicine prophets suddenly called upon them to resist—now was the hour—their Ghost shirts would make the soldiers powerless. Young Black Fox, a Ghost Dancer of the Cheyenne River reservation, threw up his gun, from under his blanket, and fired at a soldier. All the soldiers fired; the Indians fought back; the machine guns opened; and in a twinkling two hundred Sioux men, women, and children children, and sixty soldiers, were piled, dead or wounded, upon the snowy ground. This was the battle of Wounded Knee, and was the last of the Ghost Dancers. Meanwhile, after the cavalry had rescued the police, Red Tomahawk put the body of Sitting Bull into a wagon, and with two prisoners took his troop up to the Standing Rock agency, to report. Little Eagle, Afraid-of-soldiers, John Armstrong and Hawk Man No. 2 were dead; Lieutenant Bull Head and First Sergeant Shave Head died in the hospital several days later. Bull Head had four wounds. The four dead police were buried in the reservation cemetery on the second day, December 17. A company of the Twenty-second Infantry fired three volleys over their graves, and a great throng of the Sioux were present, to mourn. The police had been brave men. That was his end, on this earth; for, as far as known, he never came back from spirit land. The pretended Messiah's promises proved false. The white men remained stronger than the ghosts. The Indians seemed to have no "medicine" to equal the terrible shoot-with out-loading guns of the blue-coat soldiers.